Second India-Korea Business Summit organized by the Department of Industrial Policy and Promotion (DIPP), Ministry of Commerce & Industry, in partnership with ChosunILbo, KOTRA, Confederation of Indian Industry (CII) and Invest India, was held in New Delhi on February 27. Aim of the summit is to strengthen the economic relationship, boost trade relations and increase investments between India and Republic of Korea. 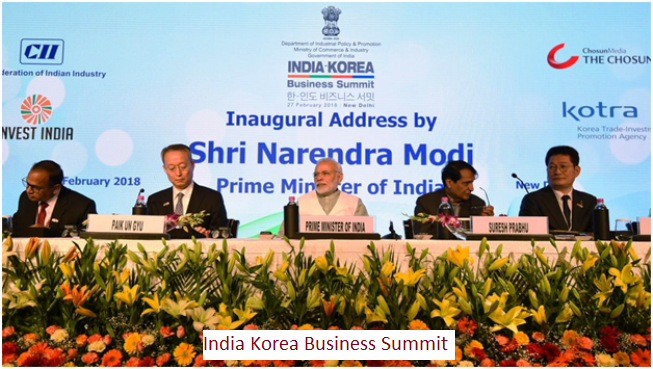 The summit began with a roundtable of Korean CEOs which was chaired by Prime Minister Narendra Modi. It highlighted the strategic partnership between India and Republic of Korea and the potential of increasing trade and investment between the two countries. The roundtable gave the Korean companies an opportunity to discuss their investment plans and resolve any pending issues being faced by the Korean companies in their India operations. The roundtable included delegates from both Governments and 25 CEOs from leading Korean companies with an estimated revenue of USD 575 billion. Prime Minister in his inaugural address outlined his vision for greater economic engagement with the East and outlined the need to further boost partnership between two countries through investment and collaboration. The Prime Minister invited Korean investments in India in Railways, Water Transport, Energy, Electronics, IT and Infrastructure. Commerce Minister Suresh Prabhu, highlighted the recent reforms undertaken by the Government of India, the Make in India initiative and India�s achievement in global ranking. On the sidelines of the summit, several B2B meetings were arranged. The summit addressed various issues across industries and was attended by over a thousand delegates, including 425 South Korean delegates from 90 Korean companies, senior government officials and political leaders.